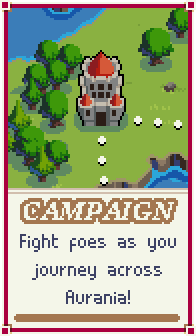 Campaign is the main story mode of Wargroove. Players embark on a quest across the continent of Aurania to gather allies for the Cherrystone Kingdom as it faces an invasion by the Felheim Legion. Under cover of night, High Vampire Sigrid makes a daring attack on Cherrystone Castle. Alone in the woods, Caesar finds some villagers in need of aid. With Sedge defeated, Emeric faces a new Floran threat. Unhappy with Sedge's deception, Greenfinger confronts the wayward commander. Caesar once again encounters those pesky outlaws. Ragna's blood is up and she's itching for a fight. Any enemy will do. Deep in the Lost Leagues, Emeric decides strange times call for strange magic. They've taken everything the Lost Leagues had to throw at them, except this final foe. Their destination reached, our heroes find the Heavensong border guards less than hospitable. Having fallen to Nuru, the Heavensong border soldiers call in their commander. Ryota is defeated, but here comes Koji. Emeric steps in to take on the plucky prince. An abashed Royta tries to explain himself. Two old friends relive the happy days of their youth. Now allies, Emeric and Koji band together to take on a shadowy foe they thought they had eluded. Time for Caesar to rally the troops again; the outlaws are up to their old tricks. Ryota looks to settle a long-standing score. Mercia and the others arrive to meet their fleet, only to find the port overrun. If you ask Nuru there's always time for fun, and what's more fun than taking down a rampant giant? Mercia has set sail for Felheim, but our heroes aren't the only ones who have taken to the sea. They really thought they were safe this time, but the outlaws are in for a surprise. Nothing stands between Sigrid and what she wants. Ragna is sunk, but an army awaits our heroes on the shores of Felheim. Emeric and the gang have held off Valder's forces, but now Mercia must face The Fell Lord. Valder has joined the allies, and it's time for Mercia to face Sigrid. With Sigrid and her plan put to rest, our heroes face a yet mightier foe. This mission won't unlock before earning 100 Stars ( ). 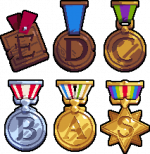 Stars can be earned in Arcade, Campaign, or Puzzle modes. Elodie is gone, but Requiem remains. What will Mercia do? Earning an S rank is dependent on completing a mission within a set number of turns. Missions can replayed at any time to earn higher rankings and the full amount of stars. Income 500-0 Earned income per building at the beginning of the turn. Default is 100, but can be to 500 gold per turn (easier) or down to 0 (extremely hard). The intended Wargroove experience is "Default Mode", where all three sliders are set to 100% (or 100 in the case of Income). Adjusting the sliders to "Easier Mode" or "Custom Mode" reduces the maximum number of stars that can be obtained per mission from three to one, while "Harder Mode" offers additional challenge but no extra rewards. This page was last modified on 18 February 2019, at 19:55.